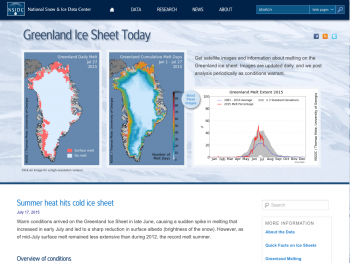 The rate of ice loss slowed in the first half of July, primarily because of a change in atmospheric circulation. The dipole anomaly, an atmospheric pattern that dominated the Arctic in June, broke down. It was replaced by a pattern of low-pressure systems tracking across northern Eurasia and then into the central Arctic Ocean. 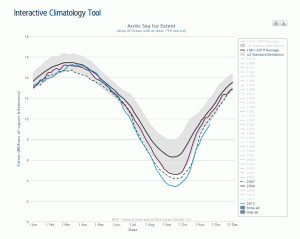 From July 1 to 15, Arctic sea ice extent declined an average of 60,500 square kilometers (23,400 square miles) per day, 22,500 square kilometers (8,690 square miles) per day slower than the 1979 to 2000 average and substantially slower than the rate of decline in May and June. Ice extent remained lower than normal in all regions of the Arctic, with open water developing along the coasts of northwest Canada, Alaska and Siberia. As of July 15, total extent was 8.37 million square kilometers (3.23 million square miles), which is 1.62 million square kilometers (625,000 square miles) below the 1979 to 2000 average for the same date, but 360,000 square kilometers (139,000 square miles) above July 15, 2007, the lowest extent for that date in the satellite record. Through much of May and June, high pressure dominated the Beaufort Sea with low pressure over Siberia. Winds associated with this pattern, known as the dipole anomaly, helped speed up ice loss by pushing ice away from the coast and promoting melt. However, the dipole anomaly pattern broke down in early July. In the first half of July, cyclones (low pressure systems) generated over northern Eurasia tracked eastward along the Siberian coast and then into the central Arctic Ocean, where they tend to stall. This cyclone pattern is quite common in summer. The low-pressure cells have brought cooler and cloudier conditions over the Arctic Ocean. They have also promoted a cyclonic (anticlockwise) sea ice motion, which acts to spread the existing ice over a larger area. All of these factors likely contributed to the slower rate of ice loss over the past few weeks. In the last few days, high pressure has started to build again in the Beaufort Sea, but whether this will continue remains to be seen. Satellite images provided by the University of Bremen, from the NASA Advanced Microwave Scanning Radiometer – Earth Observing System (AMSR-E), show areas of low ice concentration over the central Arctic pack ice. While we normally report on the extent of area covered by at least fifteen percent sea ice, a more reliable measurement, it is also valuable to look at ice concentration values, which can reveal conditions in more detail. However, it can be difficult to interpret AMSR-E concentration data during the summer, because microwave signals associated with low ice concentration look very much like signals associated with surface melt. Weather effects can also cause false concentration signals. By comparing AMSR-E data with data from other satellites, we can determine which areas of apparent low-concentration ice are real, and which appear to be low because of melt or atmospheric effects. Visible-band images from the NASA Moderate Resolution Imaging Spectroradiometer (MODIS) sensor show that some of the areas of apparent low ice concentration within the central pack ice are actually melt and atmospheric effects. However, the MODIS data also confirm that there are substantial areas of open water within the pack ice, such as near the North Pole and in the Beaufort Sea. Open water in the interior pack ice is not unprecedented. Winds can push the ice apart, creating openings in the pack ice. These areas of open water may close up quickly if the wind changes, but since the dark areas of open water readily absorb solar energy, they can also lead to more extensive melt.